Cover: Very eye-catching with its bright green colour and shadowed figure with the copyrighted words behind them. It’s definitely one that draws your attention. Speth lives in a world where, from the moment she turns fifteen, every word has to be paid for. Every single word and many actions are trademarked and people have to pay to use; a single sentence can set you back hundreds of dollars. Most people live in crippling debt and when Speth’s friend commits suicide rather than work off that debt, she refuses to speak another word. But when this action catches on with the growing population what will multibillion dollar corporations do to get her to talk? 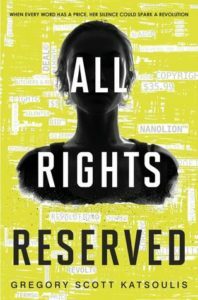 This dystopic novel is a very timely novel, taking the modern need for copyright ownership, intellectual infringement and the lawsuit mentality and taking them through to their natural conclusion. In this world, all words are property of someone else. All music, clothing, hairstyles, actions and ideas already belong to someone. Anything and everything you do can be charged. Every fifteen year old is fitted with a Cuff that records your actions and fines you accordingly. Speth’s sister Saretha is charged $9.98 for the phrase “It’s beautiful.” And $2 for patting her sister on the shoulder. With charges like this it is easy to see how everyone is swimming in debt. Added to that is the National Inherited Debt Act that actively looks through your past to see if any of your family ever broke trademark and adds that to your debt. Most families have been torn apart because of their ancester’s illegally downloading music, owning pirate CDs or other atrocities. Speth’s parents are taken away because they ‘owe’ six million dollars and, from the outset, it looks like every single one of her friends has the same situation. All of their parents are absent and they are bought up by a Custodian who has their words paid for by the government. Her job is little more than to keep the children in line and get them endorsements for products. The moment Speth turns fifteen she is supposed to make a speech endorsing some products as her first officially paid for words. Crowds of her friends are gathered to watch and during this time a friend commits suicide rather than pay off the debt of his family. As a reaction to this Speth decides to ‘zip her lips’ and refuse to speak. She shuns all sorts of communication. She refuses to speak, to nod, to smile or engage whatsoever. One might think that this is heroic; a way to stick it to the man. But in reality Speth is a scared girl who has no idea what she is doing. In the same vein as Katniss from Hunger Games, Speth is a reluctant hero. She isn’t doing this to save everybody, to make a stand or start a rebellion. All she wants is some choice over her actions. In that way she is a sympathetic figure, one who you want to succeed. Sadly her reluctance to speak starts to grate on you. She is given several chances to speak, to explain herself without repercussions, but she doesn’t take them. She also causes harm to many people, not just through her silence but through her actions and these do not seem to bother her at all. Speth becomes less sympathetic and more annoying the further you go in the story. Perhaps because she doesn’t have dialogue and we can only judge her based on her actions and stream of consciousness she comes across as cold-hearted, single-minded and obstinate. Her refusal to speak becomes less of a stand and more of a sulk. On the whole the other characters seemed one-dimensional, whether that is because we only have Speth’s point of view is unclear, but it does make for some tropic stereotypes. The villain Silas Rog is a megalomaniac bordering on psychopathic; the governmental pseudo-parent- Mrs Harris- is mercenary and heard-hearted; the plucky younger brother is wise and brave; the love interest is sweet and kind hearted and so on. The story gets going and takes several different direction which add to the rich world that Katsoulis has created. I loved reading about the Adverts that pop up in your cornea implant which you have to watch or be fined. It reminded me of a Black Mirror episode with a similar premise. The Product Placers were a great touch and the whole society was fascinating as well as bleak. There were a few inconsistencies which did grate on me. Speth tells of her parents talking to her about “liberties” where a person could take out books for free, yet later on she clearly knows what a library is. She breaks the heart of one of her new ‘friends’ and uses another and yet they trust her implicitly without repercussions. The Carol Amanda Harving twist was brilliant and yet was suddenly dropped and ignored. Several times it read like Speth has completed an action that should have been charged for but was ignored. When she uses her gymnastics to go from rooftop to rooftop during her training shouldn’t she have been fined? That said I have to say I did enjoy the book. The world that was crafted was so in depth and interesting that any glaring omissions were able to be ignored. I would recommend it unless you are triggered by suicide and indentured servitude. 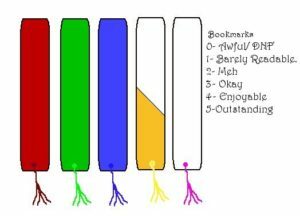 3.5 bookmarks out of five.